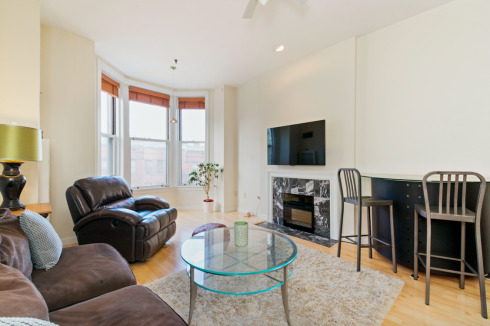 Beautifully renovated third floor, two bedroom, two bathroom corner residence at The Marlborough! This homes boasts high ceilings and large windows throughout offering magnificent light. The formal foyer leads to a spacious and sunny living room with a decorative fireplace and large bow window with pretty views. Beautifully renovated gourmet cook’s kitchen open to the living room with granite counter tops and stainless steel appliances. The master bedroom suite has three separate closets and an en suite luxurious master bathroom with custom Italian glass door and a chromatherapy spa bathtub. The second bedroom is spacious and sunny. Newly refinished hardwood floors and freshly painted. Washer/dryer in unit, central air conditioning, and pet friendly. Elegant concierge building with pretty common areas, elevator, fitness room and stunning common roof deck with magnificent City and Charles River views!